Russian World Forums • View topic - To Evpatoria! Post subject: Re: To Evpatoria! After spending some good time upstairs, we head down the mountain on our own, not using the "guide" route on signs. We ended up much too low in the mountains and had to go mountainclimbing back up a little bit. My mountain goat errrr Mountain woman Lena does this without effort, arriving fresh back on the known path. I am totally exhausted by the time we are back down in the little tourist town on top of this mountain. We are jumped by locals who want to sell us food, souvenirs, shashlick, etc. etc. Lena keeps holding them off and I hold her hand so they leave me alone too. When she was satisfied with a place where the food looked ok, she agreed on entering this establishment and we sat down for shashlik and fruit juice (once again pineapple!). Catching my breath meanwhile, enjoying her company and the food... Life just doesn't get better than this! We headed back to the queue for the cable cart downstairs. While we were waiting, I noticed a couple of peacocks and I thought of taking a picture. Then I noticed they were chained to a bench so I decided not to. I don't want to encourage this misbehaviour. Meanwhile a man was harassing Lena for a picture with a Hawk, which was chained to his glove. She felt the same as I do about these atrocities and said no quite loudly. Meanwhile we both spotted a kid abusing a young bear (1-2 months age maximum) we both felt bad for the poor animal but Lena remarked that after 2 more months the bear would be large enough to tell the kid to get lost. So, we finally entered the cart and headed back down the mountain. I told Lena if she wanted souvenirs from Yalta trip, just pick them up. I got a nice natural stone with a Toyota-sign embedded in it. These guys are totally car-enthousiasts... Lena got herself a nice stone Turtle statue. We exit the tourist city and head down the path back to Yalta. 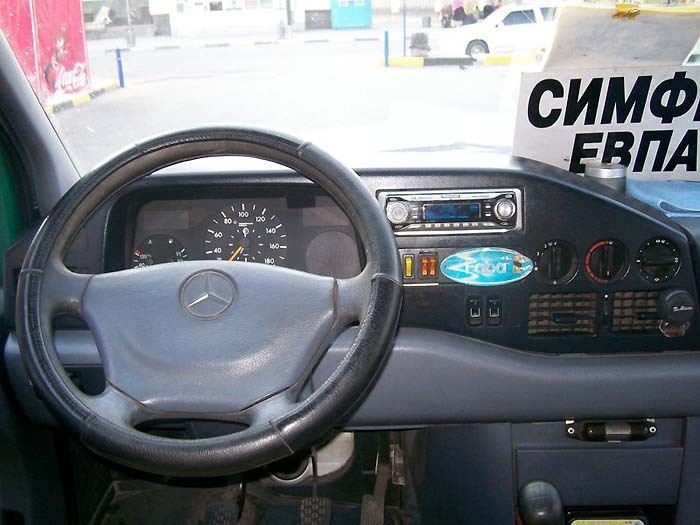 I tell Lena I would like a taxi back to Simferopol and get a bus there, instead of entering the bus in Yalta. She said it would be too expensive, but I don't care. That last part of the busride was too slow. After passing a few waiting taxi's , Lena haggled over price and declined and continued walking. Then an old Lada cab asks only 300 Grivna's, I think ok, but we can get better car. Next up is 250 Grivna's in an old Opel Senator and it looks luxurious. I tell Lena to accept this deal, and off we go. Lena talked to the driver a while and I notice we stop in Yalta near a pharmaceutical shop. Lena forgot to buy something and exit the car to enter the shop. I stay in the Taxi and the driver takes this oppertunity to pop the hood and talk to some locals, I think they are his friends. Lena is back shortly, within 5 minutes. We start our journey towards Simferopol. I notice the fuel meter is nearly empty, so it is no surprise to me that after only 40 km we enter a gasstation. Big surprise, the car pulls up to an "autogas" pump instead of regular fuel! how clever!. The cabbie tells us we need to exit the vehicle because of safety regulations by Ukrainian government. While we wait , I take some pictures of the mountains around us and take a look at the hood of the Opel. It has some airbrush painting of horror vampires on it. Lena asks me if I like that sort of thing. I tell her it looks pretty but it is not my style. I say a fast car should have an eagle or someting. My style however is a "wolf in sheep clothing". However, due to her english capacity I am unable to convey this to her. The car finished refueling and we head on the road again. Then I notice the driver looks tired, and he speeds a lot (120kph where 80 is allowed) and 2 or 3 times I hold my breath as he overtakes dangerously. We get to Simferopol safely though and enjoy some time together before our bus leaves for Evpatoria. Lena doesn't feel like company of other people again so we agree to sit directly behind the driver (legspace for me, privacy for her). The trip back is uneventful and quite speedy due to a good mercedes sprinter bus. We talk some in English and I notice how quickly her skill is improving. It seems like only 5 days ago.... oh it was 5 days ago Smiley that we needed the dictionary for every other word. Now I have seen the dictionary only once today. Lena tells me my after-shave smells too strongly (hugo boss) and I should put on less tomorrow. I think this is a strange remark, she never complained before. We enjoy dinner in my hotel room with the leftovers from our picnic-basket from Lena's mother. I joke that Mama K... is a good cook. Lena tells me she does not like me to call her mother K.... it is her family name but not her mothers. I assume K... is her father's family name and they did not separate on good terms. I ask Lena what her Mother's name is then. She tells me her mothers full name. I cannot pronounce nor remember it though, very long and difficult family name. I tell lena I will just call her mother "Mama" or "T..." then, Smiley Lena laughs and agrees. So I repeat my joke and say Mama T... is a good cook. Lena beams at me. After a wonderful evening Lena departs home again. Onward to friday!. I am awoken early by Lena's message on my mobile phone. She is very sick and does not want to meet me. I nearly faint! I tell her good health and sleep well. about 30 minutes later she sends me another SMS. "I think when a man likes a woman, he will send her gifts (not souvenirs) and does not allow her to spend her own money"... I ponder about this statement at least 1 hour and feel very humiliated. I decide to sidetrack her and reply : "I am a man, please forgive me and meet me for dinner". I had hoped her statement that she is sick is a blow-off and she is not really sick. Her answer is very clear though "I very grievance". So I was wrong, she really is sick. Damn what to do! I SMS Manny if he can arrange for flowers to be sent to Lena with a get-well-soon card. I also SMS Lena "Good health soon, sleep long". It will be easier to understand for her limited english. My day crashes, I spend time reading a book my sister gave me (the same one from monday!) and when the roomcleaners come, I take a stroll through Evpatoria without her. The city really is beautiful with lots of nice things to see, but my mind is not with it. After 1 hour I return to the hotel and the room is clean. I had planned to spend today buying souvenirs for my family at home and let Lena buy a very nice goodbye gift, but I fear its not going to happen. While I am lost in the book again taking away my sorrow for a while.... I have simple Lunch in hotel Planeta, which tastes good. When I am almost 2/3 through the book it is nearly 4 PM, my phone beeps again. Lena slept very well and feels much better. She would like to have dinner, where do I meet her? I tell her to goto my hotel by Taxi, I will pay for it. It is not good for recently sick to walk outside. She says she will send me SMS when she leaves home. My mind is racing through the options, but I get only 1 conclusion. Wait until she arrives at the hotel. After I recieve an SMS from Lena that her taxi is with her, I put on my shoes and coat and walk to the front of the Hotel. I am there Early, but Lena arrives soon after. I pay her cabbie and she waves him away. This was a surprise for me, she doesn't look sick. I tell her we will go to Restaurant Sankt-Petersburg again, but why did she send the taxi off? She said the walk outside in the sun will make her feel better as she still has a mild headache. 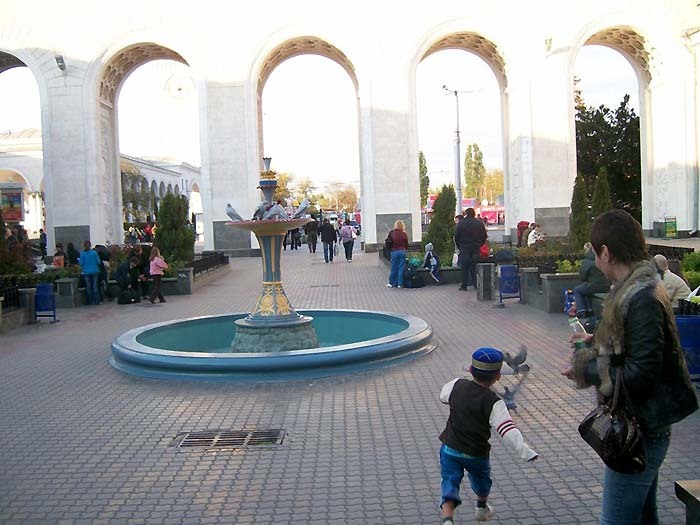 We walk through the park parallel to Evpatoria's main street towards the restaurant. The man who takes our coats has an ugly scar and looks like a mobster!!! how quaint! The restaurant is marvellous as always. I order Salmon this time and Lena immediatly joines me. She says fish is her favorite food, so I store this knowledge for later use. I have a feeling Lena will find some of the Dutch customs very interesting since they involve sea-food. We talk about fun things that happened this week and we have a good time together. I steer the conversation towards the SMS she sent me that hurt my feelings. Lena is embarrassed and says it was not her intention, it was an attempt at Humor since I took good care of her, but because of her bad english and her mind not sharp as she was sick, it came out totally wrong. Her mother apparently told her a joke about rich westeners showering their girls with expensive gifts and I brought her only a souvenir from Netherlands. We both laugh at the uncomfertable moments we had and we both agree patience is a virtue and we will both need tons of it when dealing with the language-barrier. I told lena once again, I loved thursday in Yalta and the dinner we had (picnic ala Mama) was the best food of the entire week!. We go back to my hotel room early to say our goodbyes since I depart back to Netherlands at 5:30 AM that next morning. Lena however , does not really want to leave early. Being cute and cuddly to eachother she manages to drag time until 23:30 PM before she departs towards her own house. On my request she asks the hotel desk to wake me next day at 5:45 just in case my own mobile phone alarm doesn't wake me at 5:30. I goto sleep very tired , but satisfied and rethink the week in my head. I never felt happier. In hindsight, I think that sick day has been a good experience for me, It will help me prepare with the culture shock Lena will have if things continue to go well between us. She will feel lonely and lost in Netherlands alone without me, and this friday helps me to understand her better when that happens. Meanwhile my work granted my second vacation, so I will return to Evpatoria 5 July for 2 more weeks of joy with a new relationship that is growing. The - End , now we are to be married soon and Lena is pregnant with our first baby. I hope you enjoyed reading this report.!. We were busy packing the last items in our car just before leaving my home in Netherlands. When we were almost finished, my front door fell in the lock with all the keys inside my house. Angry after confirming our passports are still in the house, I rang my dad and got the spare key from him. .... this was the first bad omen on my trip. The border from cottbus (Germany) into Poland has notoriously bad tarmac. Think spikes that can punch a tyre and bumps so frequent you think you are driving a jack-hammer instead of a car. After 30 km I needed a rest and my muscles ached all over. I got out, walked around to get the blood flowing again and something caught my eye. It seems a 2x2 inch rubber was missing from my tyre. F*ck it, I need roadservice in Poland to change the tyre. 2 hours and 230 Euro (for 2 new tyres + wages) later (damn those polish guys are cheap), I was back on the road. Whilst we are having a relaxing drive now due to virtually new highway (thanks EU!) it is getting kind of late and we are ready to check into a hotel.... 1st are having a marriage party, no luck. 2nd having a marriage, sorry. 3d ... you guessed it, 2 marriage parties and full. so it went until I was down to my 9th hotel at 23:30 PM. We finally hit one with enough free rooms, and without obnoxious sounds of marriages. The polish hotel & its majestic view of Poland nature. Today we will be crossing the Ukrainian border and enter through the station I used before, Meduka. It is a little station with virtually no truck-traffic and goes straight to lviv from the border. We waited a mere 3 hours (as opposed to 10 minutes first time) and were on our way to Lviv. The road was pretty good here, but 70-80 kph was the maximum for my nerves. After lviv we took the road to ternopil and things changed..... a lot ....... Spikes big enough to seriously mess up your suspension and potholes large enough to swallow your car. You get the idea.... Mix that in with suicide drivers taking over whenever its nearly accidents and the picture is complete. Ukrainian "normal" traffic, you can see the horror and frantic steering of the white truck! After a mere 300km my nerves were shot to hell and we decided to stop in Ternopil, which was way earlier than the planning (Uman). Lena wanted to stay 1 day extra in Uman to visit some famous "Dendra park", but this stroke of bad luck made it impossible. We stayed in Globus hotel in Ternopil (Good recommendation!!!!) which was a very nice big hotel with private parking. Good quality and not expensive too. Lena inquired if the road from Ternopil to Uman was any better and all she got was laughter so we both understood that was not the case. From Ternopil we made our way to Uman over the same horrible tarmac the day before. In khmelnitsy we got lost and had to ask for directions multiple times. We lost a good hour total, also because I missed a red traffic light and immediatly got stopped by the DAI for the necessary payments. After a friendly chat, the DAI suggested we payed 100 Grivna to him, or 462 with protokol at the local bank in khmel. Lena decided for option one, but we only had 200-grivna notes ... She asked him if he had change , and they both had a good chuckle over the joke and we were sent on our way with excellent road directions towards Uman. Lena also remarked here, that it is becoming increasingly dangerous and difficult to try and bribe local cops on "official" stakeouts like that red light... seems their paycheck is improving and corruption going down. The road to Uman was fairly uneventful, apart from the state of tarmac and we headed from Uman to Kherson through Nikolaev. At Uman also a 3-lane highway with near-perfect tarmac started towards Odessa. Ahhh relaxing driving for about 150 km until we need to turn more east towards Nikolaev. Close after Nikolaev we declared our day was gone and took a hotel for the night. Our second hotel , near Kherson. It was rather cold in the morning! Today we departed our hotel towards Kherson and Lena discovered my roadmap did not list "Melitopol" which was on the signs there. The trip went uneventful, and we arrived in Evpatoria close to 2pm with a very happy Mamma who prepared for us a glorious dinner to celebrate. The sea monument of Evpatoria! We had a very good holiday in Evp, its always good to be in a beach-resort-town with sun,sea and beaches. Lena met all her friends and her home sickness became worse actually. She felt she was "home" too short a time so next year we will go longer. We left Evpatoria early, but we took off on the wrong road. Instead of heading to Rozdolne, we followed the coast line to the north-west. Now we had a few options, follow the road until the next major crossing then return to the right road, go back to Evpatoria or follow a very-very-local road towards the right one. I chose the last option and ended up driving the local tarmac , which was more a rock-road than tarmac-road. When it turned all-rock and no tarmac, I felt we have taken a wrong turn somewhere, but I could not imagine where, since there were no turns. We hit a gravel pit, complete with excavators so I asked lena to get road-directions. The workers told us we were still on the right road, just exit the pit on the other side and in 2-3km we should hit normal tarmac again.... Now that was correct, but what they forgot to tell was that before the tarmac, we would be driving through some farmers field with track marks so deep it was too much for my poor toyota to handle. So I drove on the field with my left tyres and in the middle of the road on the right tyre.... after a painful 15kph for 3 miles, we ended up back on some main road and headed to Rozdolne. There we picked up back on the normal intertown roads and had a pretty uneventful trip to Uman. Today we went from Uman through kiev towards zhitomir... All pretty uneventful and good roads all the way. From Rivne however, we turned straight west instead of north-west to the huge border post at chelm (which cost me 5 hours my first road trip). We entered Poland after a 3-hour wait again at the border post Ustyluk. Some border guard had a good mood for us, so we went over without incidents and no search of our luggage (which was lena's biggest worry). In Poland we took the first hotel we found. We left the hotel early, and headed towards Warschaw and Berlin. The roads were pretty good, but no highways. Only after Warschaw, did we get highway but it was only a short stretch, 100km at most. That all changed when we hit the border though, from there on we had highway. We ate dinner and the rest of the trip was not noteworthy. 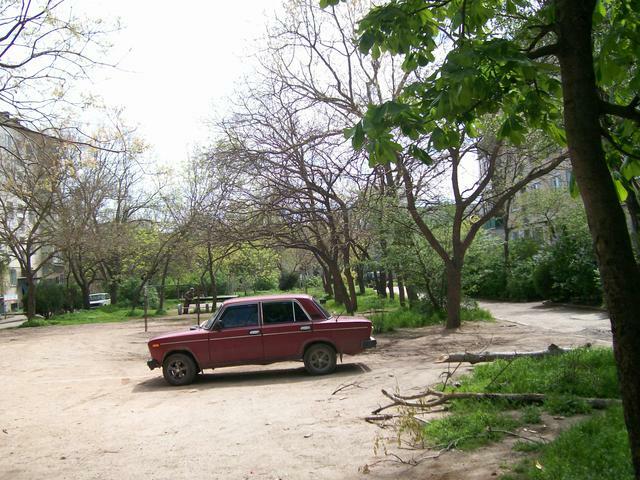 Dude, where the photo of the Lada? Was it a 1500 or a 1800? Maybe a Niva 4x4? Otherwise great read,it was nice to know this story already had a very happy ending even before I started reading it! I hope soon we will see the other trips too, when he has time... as now appears Mark is very busy indeed. One of the best I have ever read through.